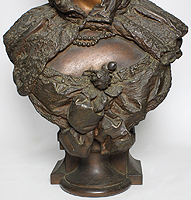 A Fine French 19th Century Patinated Spelter Bust Figure of a Young Wearing a Head Scarf. The young lady, in a brown-copper patina, posing with a right-side gaze and wearing a beaded necklace and a flower to her cleavage. Attributed to Louis Hottot (French, 1829-1905). Unsigned. Circa: Paris, 1890-1900. Louis Hottot was a French sculpture who mainly specialised in Orientalist female figures and other Orientalist subjects and themes, most of his works were produced in spelter. He exhibited his works at the Paris Salon from 1885 to 1898. Hottot is best known for his Orientalist-themed sculptures, including Almie du Caire, circa 1887 and Fille d'Egypte, circa: 1885. He was a member of the Société des Artistes Français. Literature Les Bronzes du XIXe Siecle, P. Kjellberg, Les Editions de L'amateur, Paris, page 381. 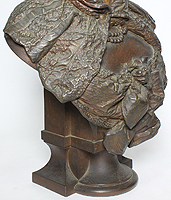 A Fine French 19th Century Patinated Spelter Bust Figure of a Young Wearing a Head Scarf. The young lady, in a brown-copper patina, posing with a right-side gaze and wearing a beaded necklace and a flower to her cleavage. Attributed to Louis Hottot (French, 1829-1905). Unsigned. Circa: Paris, 1890-1900. Louis Hottot was a French sculpture who mainly specialised in Orientalist female figures and other Orientalist subjects and themes, most of his works were produced in spelter. He exhibited his works at the Paris Salon from 1885 to 1898. Hottot is best known for his Orientalist-themed sculptures, including Almie du Caire, circa 1887 and Fille d'Egypte, circa: 1885. He was a member of the Société des Artistes Français. Les Bronzes du XIXe Siecle, P. Kjellberg, Les Editions de L'amateur, Paris, page 381.